An alien invasion movie where we never see the aliens? 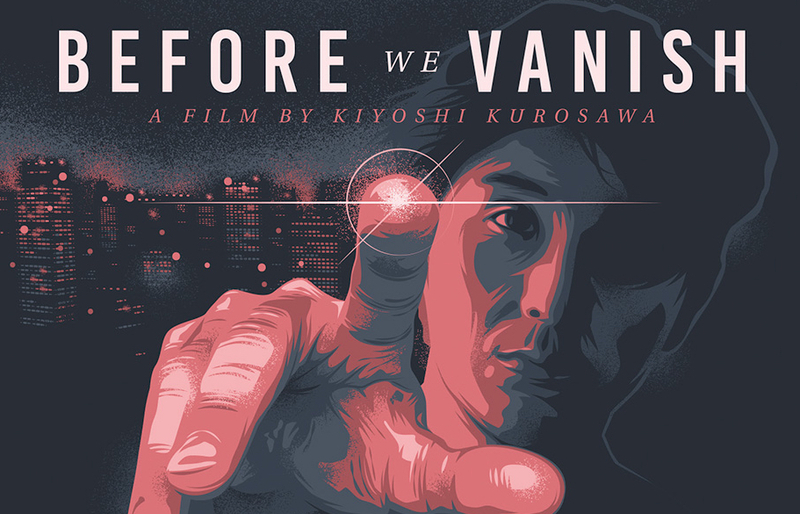 It’s an unusual concept, and in the case of Kiyoshi Kurosawa’s Before We Vanish it’s one which Marie thinks actually works. Japanese director Kiyoshi Kurosawa’s newest Blu-ray release Before We Vanishmay be described as an alien invasion film, but its true message is not about what comes from outside our world, but from within ourselves. Because this, dear viewers, is really a film about the meaning of love and humanity. Early on we encounter three characters who all appear to have undergone some kind of metamorphosis. They’re still outwardly human, but are somehow lacking in knowledge that regular people have, or even that they themselves had until recently; the correct way to read a book, for example, or even how to walk properly. We gradually realise that these three are an advance team of aliens who are sent to understand and acquire human ‘concepts’ such as work, family, possession in advance of the planned invasion. They acquire these concepts, however, by actually ‘taking’ them from others, leaving a trail of damaged or altered people in their wake. A journalist (Hiroki Hasegawa) becomes an unwitting guide to two of the travellers, while the third (an unassuming husband, played by Ryûhei Matsuda) is accompanied by his wife Narumi (Masami Nagasawa). And it’s in this husband/wife relationship that the story is at its best. The pair had previously grown apart and this strange new husband is discovering emotions through his wife’s support, which brings them closer together as they try to keep away from the apparent madness that is going on around them. Their journey challenges the audience about life’s priorities and even about the meaning of humanity itself, while all around, society appears to be falling apart as a result of the unexplained personality changes experienced by other sections of society. At the same time, government authorities are trying to track down the aliens before they can do further damage, and aim to prevent the invasion from taking place at all. Before We Vanishis the very opposite of a big-budget sci-fi film. Because the aliens are never seen in their real form, and because the story is in essence a very human one, there are very few special effects (which is just as well, because the ones that are present – explosions for example – are poor by today’s standards and belong in the 1980s). Set in the suburbs of a regional Japanese town, it all feels very small in comparison to the destruction of capital cities which we may have come to expect from similar genre movies. At 130 minutes it is definitely overlong and could use a trim, and if you prefer your aliens to be belligerent and in need of a good shooting then this is not for you. But if you’re a fan of the type of science fiction that actually makes you think a little bit about humanity and what that means, then do give this a watch. Before We Vanish is available Blu-ray and Digital HD, and is premiering on Arrow Video Channel on Amazon Prime Video in the UK on 11thFebruary 2019.